The gluteus medius is a muscle that has peaked a considerable amount of interest among those who actively engage in sports and physical activity as well as healthcare professionals alike. This muscle plays an important role in stabilizing the pelvis during the stance phase of gait and for controlling the sagittal, frontal and coronal planes of movement of the lower extremities during stance phase. An injury or condition affecting the gluteus medius can frequently be associated with a wide variety of musculoskeletal syndromes, including back, hip and knee complications from sports injuries. During single extremity weight bearing exercises, such as stance phase of walking or running, lunging and landing from a jump, amongst others, the lower extremity joints are designed to naturally absorb the impact of gravity being placed against the body. When the force of gravity acts upon the body, the joints move into distinct directions and the muscles need to properly function as to counteract these forces. Generally, these muscles function isometrically and/or eccentrically. For instance, with the absorption movements of a pelvic lateral tilt, the hip abductors work to stabilize the movement. With an anterior pelvic tilt absorption movement, the pelvic posterior tilters such as the gluteals and hamstrings work to stabilize mobility. With hip joint flexion, adduction and internal rotation, the muscles are controlled by the gluteus medius and other hip joint external rotators, such as the gemellus muscles, quadrutus femoris, obturator muscles and the piriformis. And finally, the quadriceps controls the absorption movements of a knee joint flexion, the soleus of an ankle dorsiflexion and the tibialis posterior, FHL and FDL, stabilizes midfoot pronation. The gluteus medius is a proximal hip muscle which purpose is to control proximal pelvic/hip joint motion that in turn controls lower limb kinetics around the knee and ankle. The gluteus medius attaches to the iliac crest and inserts onto the greater trochanter, functioning as a hip abductor, hip external rotator and stabilizer of the pelvis on the femur during stance phase of gait. It’s most significant role, however, is to compress the femoral head into the acetabulum during the stance phase of gait. The muscle is divided into three equal parts: anterior, middle and posterior. The fibres which make up the posterior section of the muscle travel parallel with the neck of the femur while the middle and anterior sections travel vertically from the iliac crest to the anterosuperior feature of the greater trochanter. It’s been suggested, that each individual part of the muscle functions independently from each other as each of the three portions contain their own supply of nerves which run through the superior gluteal nerve. Several conducted EMG studies found that the gluteus medius is not completely active during isolated abduction of the hip, an interesting find contrary to previous studies. The researchers also observed that the tensor fascia lata, or TFL, is considerably more active during isolated hip abduction. It was additionally suggested that the three portions of the gluteus medius muscle have a phasic muscle action during the stance phase of gait. First, the posterior fibres of the muscle are far more active at heel strike and then, the muscle is gradually inducted from posterior to anterior as the movement of the structures occurs from an early stance to a late stance of gait. Most specifically, the front section of the muscle is most active while at full stance during the single extremity support phase while the back fibres function effectively at the beginning of a heel strike. During the same study, it was suggested that the primary purpose of the gluteus medius is to restrain the head of the femur into the acetabulum, or socket of the hip, throughout normal movement as well as to help stabilize the pelvis on the femur in single limb stance. They also proposed the assumption that each of the three distinct portion of the muscle performs a unique function of movement. Primarily, the posterior fibres of the gluteus medius contract during the early stance phase to secure the joint into the socket. According to the study, this notion was supported by the observation that the posterior fibres have an almost parallel fibre alignment along the neck of the femur. Therefore, it can be concluded that the posterior fibres essentially function to stabilize and compress the hip joint. Subsequently, the middle and anterior fibres of the gluteus medius, which travel vertically, initiate hip abduction, which is then completed by the TFL. These fibres function together with the TFL to stabilize the pelvis on the femur, in order to prevent the other side from dropping. The researchers demonstrated that the TFL plays the most crucial role when supporting the pelvis against the hip while the gluteus medius only aids this process. The anterior fibres allow the femur to rotate internally in relation to the hip joint during the mid-to-end stance phase. This is important towards pelvic rotation so that the opposite side leg can swing forward furing gait. The anterior fibres play this role along with the TFL. Furthermore, the study hypothesized that the primary functions of the gluteus medius are to stabilize the femur against the ilium, to perform as hip rotators and to near the head of the femur into the acetabulum, creating a very tight and stable hip joint during gait. The gluteus medius has been considered to only function while in neutral hip/pelvic postures as it would when supporting the pelvis and hip during single extremity stance. Exercises and physical activities which force these muscles into lengthened or overly shortened positions may in fact not target the gluteus medius but other hip abductors and external rotators instead. The gluteus medius has the largest CSA of the hip abductors and is considered to be the most dominant of the hip abductors. It can generate tremendous amounts of force despite of its size due to its short fibres which are packed tightly together. However, it does not create large forces over a wide range of lengths. Instead, it is designed to function isometrically to balance the hip on the femur. Injuries or conditions affecting the gluteus medius can be associated with a wide variety of musculoskeletal complications. These type of issues can occur when the muscles of the gluteus medius are unable to properly control the movements and alignment of the pelvis, femur and tibia. These injuries or conditions include but are not limited to: patellofemoral pain syndromes, lumbar spine complications, ITB friction syndromes and hip joint pathology. For some time, it’s been believed that hip internal rotation is an undesired pathomechanism of the hip joint as hip joint rotation allows the femur to move inwards and develop valgus collapse at the knee. It’s been suggested that this unwanted hip internal rotation is a consequence of a weak gluteus medius and other hip joint external rotators. However, studies have also suggested that, as a matter of fact, these muscles seem to function better physiologically if the hip is placed in some internal rotation. Direct trauma from an injury to the gluteus medius, such as trigger points, strain injuries, tendon tears and relative trochanteric bursitis, have also been closely associated to having a weak gluteus medius. A wide range of studies have investigated the purpose of the gluteus medius whilst performing several lower extremity exercises. The following conclusions were based on corresponding electromyographic, or EMG, data during specific exercises. 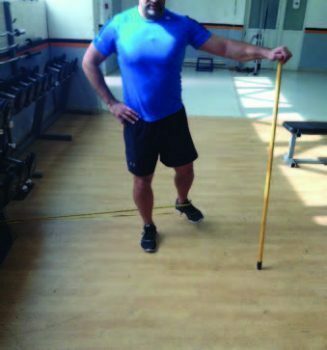 In a more recent study, researchers looked at the relative contribution between the gluteus medius and the TFL and identified five exercises that best utilized the muscles of the gluteus medius with minimal TFL: Clam with Thera band, sidestep with Thera band, unilateral bridge, quadruped hip extension, knee extending and quadruped hip extension, knee flexing. Because there’s many exercise variations which may be beneficial to strengthen the gluteus medius, many healthcare providers may utilize a rehabilitation approach depending on the individual’s level of pain when performing the initially recommended exercises. If the individual experiences pain while participating on weight bearing movements, then non-weight bearing variations may be used. Healthcare providers may often also recommend specific exercises according to what they believe may be the most effective program for the individual’s gluteus medius complication. Furthermore, it’s been previously argued that what an individual feels in and around their posterolateral hip, may be the gluteus medius and/or other hip abductors, such as the gluteus minimus, or other deep hip rotators, such as the piriformis, the obturator group, quadrutus femoris and gemellus muscles. Studies utilizing both surface EMG and fine wire EMG on deep muscles are required to demonstrate the interactions between these muscles. The gluteus medius functions in various ways during hip flexion to extension as demonstrated in the gait cycle, suggesting the muscle works through very neutral hip and pelvic positions, essentially functioning isometrically or through very short ranges of movement. The following exercises direct weight bearing through the hip joint or simulate weight bearing through the hip joint, making them more functional in terms of activation in weight bearing positions. 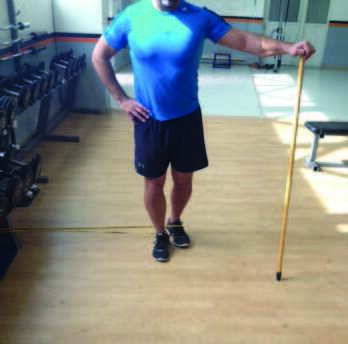 This specific exercise, manages both the stance limb, isometric, and the non-stance limb, concentrically. First, the individual should stand with a band around the foot with the hand on the same side supported by a broomstick for balance. Then, the individual must carefully move the banded leg into abduction, then external rotation and extension. The stance limb must be in slight hip flexion and remain in this position. Follow by performing 8 to 10 repetitions of slow hip abduction/external rotation/extension. The individual should feel the effects of the exercise in both the stance side of the gluteus medius while in slight hip flexion as well as the abducting side of the gluteus medius into slight hip extension. This exercise is a variation of a popular clam exercise which has been demonstrated in several studies to activate the gluteus medius muscle. 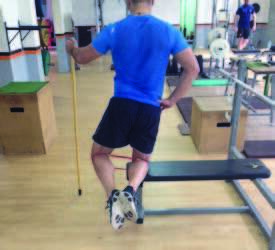 This is performed in weight bearing as the limb can accept axial loading via kneeling. First, the individual should kneel on a bench with a band wrapped around their knees. Keeping the feel together, holding onto a broomstick may be used for balance. Then, the individual must carefully move their knees apart whilst maintaining foot contact. This moves the hip into slight abduction and external rotation. Follow by performing sets of 10 to 15 repetitions and ensure the movement is kept small, about 2 to 3 inches only. This is another variation of the clam exercise which resembles the traditional clam exercise but with several variations. The first important difference is that the heels push into a wall or box to simulate weight bearing through the extremity. Then, the exercise is performed as an isometric hold and not an active abduction and adduction movement. Finally, the exercise is performed in two positions: slight hip flexion and slight hip extension. A light weight is generally placed on the knee to act as an external resistance. The goal is to hold the limb static for a specific period of time. Before attempting any of the above exercises, make sure you’ve consulted a healthcare professional to avoid further injury. The muscles around the hip can also be strengthened prior to experiencing any complication or may be occasionally directed by a specialist as part of the rehabilitation process. By strengthening the tissues around the hip, an individual can avoid damage and injury by increasing the strength and flexibility of the muscles to promote health and mobility. Manipulation is the therapeutic application of manual pressure or force to restore the normal functioning of the body by balancing the structure. Often times, complications to the spine can affect other surrounding tissues of the body, including nerves, which can ultimately radiate pain and symptoms to various organs. Best known as osteopathic manipulative treatment, or OMT, this technique is typically utilized to treat a variety of musculoskeletal injuries or conditions, such as low back pain, neck pain and pelvic pain, caused by sports injuries, repetitive stress injuries and even, tension headaches. 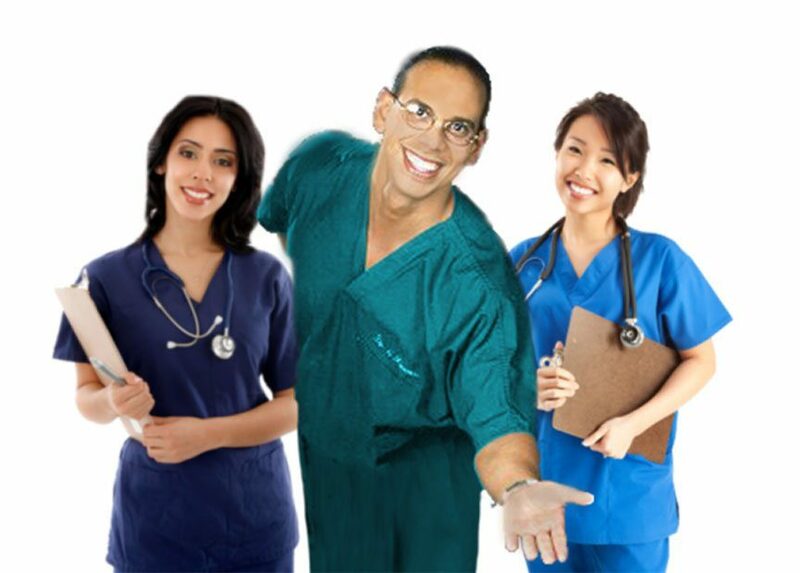 Foremost, a healthcare professional must properly evaluate and diagnose an individual to determine the presence of an injury or condition which may be causing painful symptoms. Individuals with pelvic pain, or instance, may experience painful symptoms along with connective tissue restrictions along their thighs, and glutes, including the gluteus medius. Pelvic manipulations may commonly be used in this case to improve blood flow to the affected area, decrease swelling and restore mobility to the surrounding structures. Massage is similar to a manual manipulation. 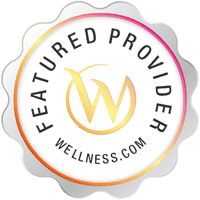 A massage is a hands-on technique that involves applying gentle, sustained pressure into the connective tissue restrictions, also eliminating pain as well as other symptoms and restoring function. Massage can increase blood flow, which in turn delivers more oxygen and nutrients to the muscles surrounding the affected regions of the body. The increased blood flow may also help carry away unnecessary substances which may have accumulated through time. While osteopathic manipulation and chiropractic often seem to overlap each other, they do differ from each other. Chiropractic is a form of alternative treatment which focuses on musculoskeletal injuries and conditions as well as nervous system complications to naturally restore the structure and function of the body. After a careful analysis of the individual’s symptoms, a chiropractor may commonly follow through with a series of spinal adjustments as well as manual manipulations to correct any misalignments in the structures of the body. When certain areas of the spine are subluxated as a result of an injury or condition, the surrounding structures can often become irritated and inflamed, leading to complications within the tissues, including gluteus medius issues. A chiropractor will perform chiropractic adjustments to gently re-align the spine in order to progressively reduce the pain and swelling around the affected area. A chiropractor may even recommend a series of exercises according to the individual’s needs to promote healing and speed up the rehabilitation process. Chiropractic care has become a popular alternative for many types of complications, including back pain, neck pain and pelvic pain, among others primarily due to its effective treatment techniques.